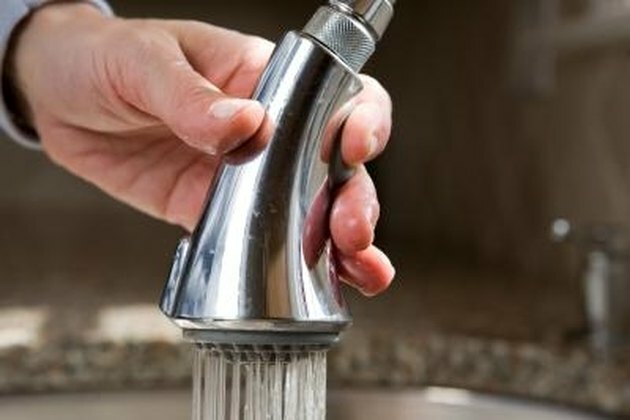 Your kitchen faucet's spray head has several small, round nozzles on its face, each dispensing water in a thin stream. This forms a spray of water ideal for cleaning and rinsing dishes. The small size of the sprayer nozzles make them prone to clogging from sediment buildup. Minerals block the sprayer head, depleting the spray pressure and lowering the overall impact of the water on your dishes. Solve this problem by regularly cleaning the spray head. Cleaning a pull-down sprayer head increases performance. Detach the face of the kitchen sprayer head or the plastic nozzle guard over the head of the sprayer. Insert the sprayer head key into the front of the sprayer and turn it counterclockwise or as recommended by your manufacturer's cleaning and care instructions. Turn on the water, then turn it back off. Hold the sprayer over the sink and carefully run your fingers over the nozzles while the sprayer head is still wet. Operate the sprayer once more to determine if the sediment buildup is clear. If not, proceed to the next step. Continue to rub your fingers over the sprayer until it returns to normal operation. Run them in a sweeping motion and make contact with all the nozzle heads to clean each one successfully. This is all that is required to clean the sprayer head. When Do You Spray Apple Trees and With What Chemicals?